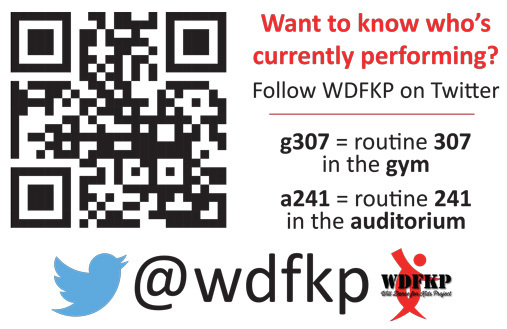 We will have several posters hanging around the school with a QR code that people can use a QR reading app to take them directly to the WDFKP Twitter feed. The sign will also have a simple explanation of tweets. Below is what our sign will look like. We will also be posting this on all of our social media accounts and our website. Please share this information with your students and parents. If you aren’t ‘Tech Savvy’ here are some step-by-step instructions to set up your own Twitter account. In order to see the Twitter feed you’ll need to have your own Twitter account. You’ll want to set up your account before the competition to avoid extra stress at the competition. It will bring you to a new page where you will check your information. Make sure everything is correct, then you can choose a username. It will then take you through several steps. Step 3: it shows you several people/businesses to follow on Twitter. Click the “X” on any person you do not want to follow. When finished click the “Follow & continue” button. Step 4: Customize your profile. You can add a profile picture or skip this step. If you upload a photo click “upload” and follow the steps. When finished click “continue.” If you don’t want to upload a photo, click “skip this step for now.” You can always add a profile picture later. Step 6: This is where you’d choose from your contacts who you’d like to follow. If you chose not to find your contacts it will take you to the Twitter home feed page. Twitter will send a confirmation email to the email account that you provided. Be sure to look through your email and find this message and click the “confirm now” button in the message. On your smartphone go to the Google Play store or the Apple store and download and install the free Twitter app. Once installed be sure to sign in. WORLD DANCE MOVEMENT IS COMING TO THE UNITED STATES!